The Daylight is the latest addition to the Roxy Spring/Summer Apparel collection 2015. 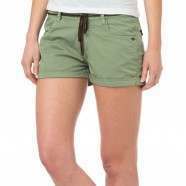 These Shorts for women feature a twill weave and a fixed waistband & cuffed hem. Other special characteristics include a 3/7.5 cm inseam and a composition of 100% Cotton. Size: 27.